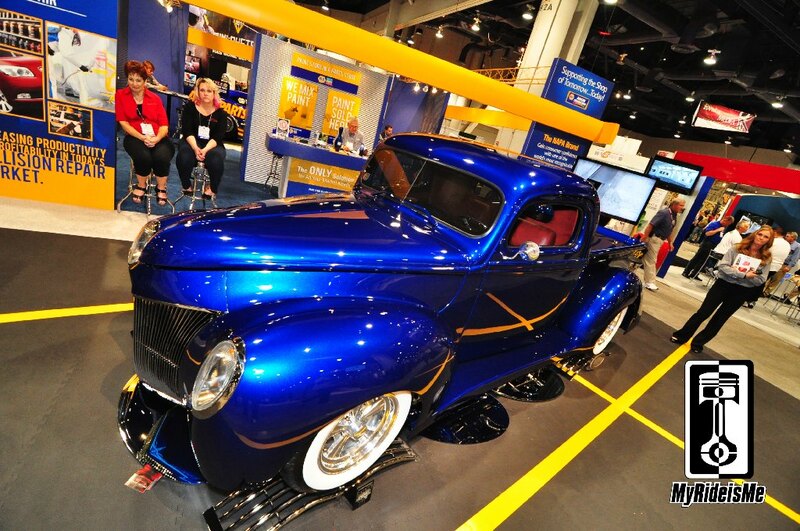 Once again, is SEMA known for Hot Rods? Ahhh… maybe it’s time we changed our minds! 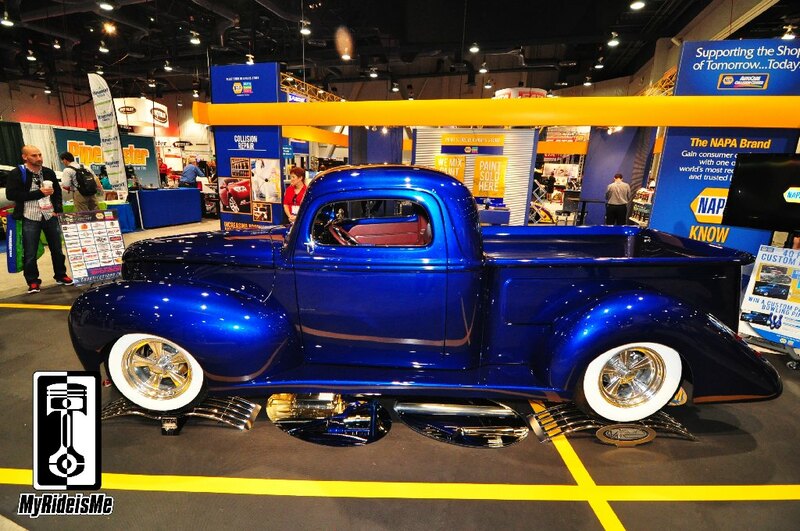 I’ve got a couple more hot rods from SEMA Show 2013 to share with you! This one’s from our friends at Chaotic Customs in Kansas. 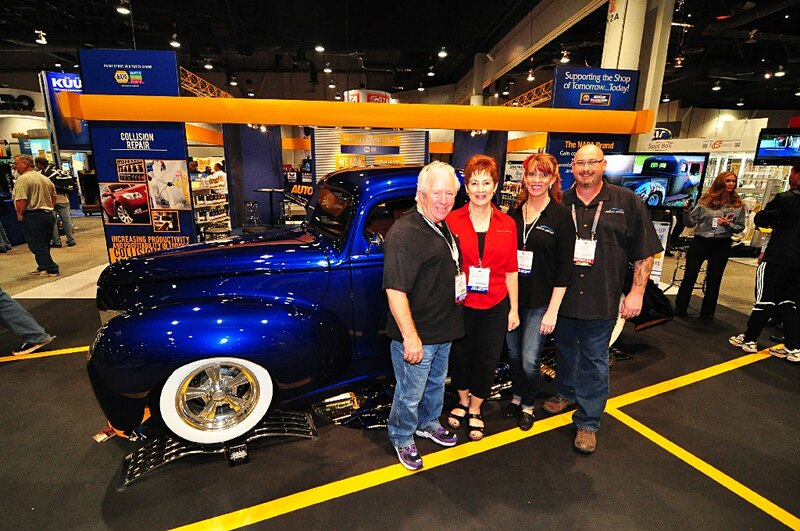 Owners Chris and Karma Carlson hooked up with NAPA Auto Parts and Martin Senour Paints to have the freshly done hot rod pickup in their SEMA booth. A wise choice! 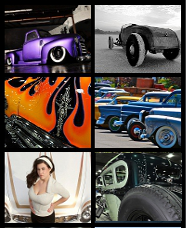 When you review all the build pictures, you’ll start to see all the customizing work done by Chris totaling 200 body mods. After trying some body work myself, I’m most impressed on how smooth and straight the bodywork is, especially under the harsh lights of the convention center. 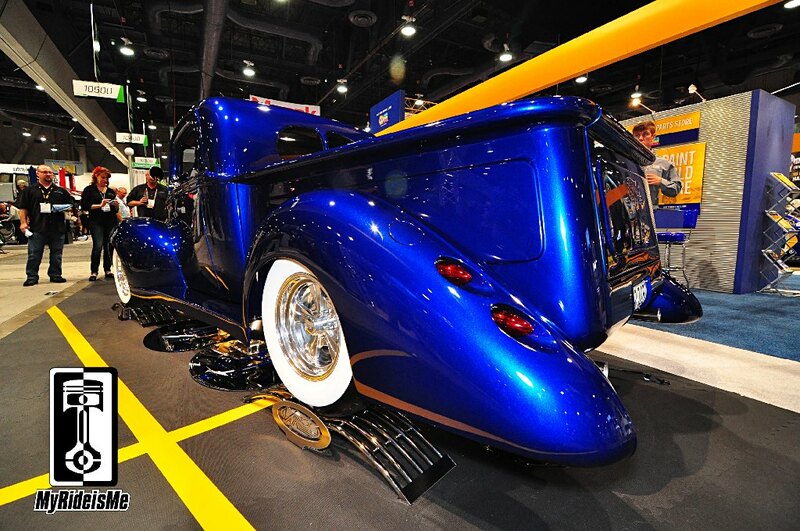 All the welds and new or repaired panels needed to widen the rear fenders 1.25 inches and stretch 12 inches fade into a sea of custom made blue paint called, “Bankrupt Blue”. After chopping the cab 4 inches and sectioning 2.5 inches, it was stretched 5 inches for a little more room inside. All that maneuvering forced the Chaotic gang to make a new rolled top from about midway back, all the way past the custom curved rear glass. The whole truck was channeled over the frame to sit low and mean. Inside, the customization continues. 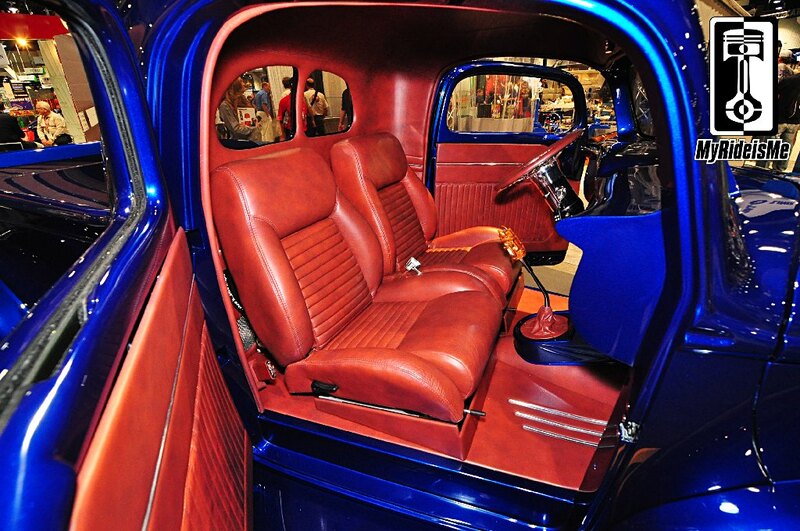 Bucket seats match the leather used on the door panels and roof. A tilt column sits in a custom dash holding center mounted digital gauges. Swing away suicide doors are also on the list of MANY custom features. 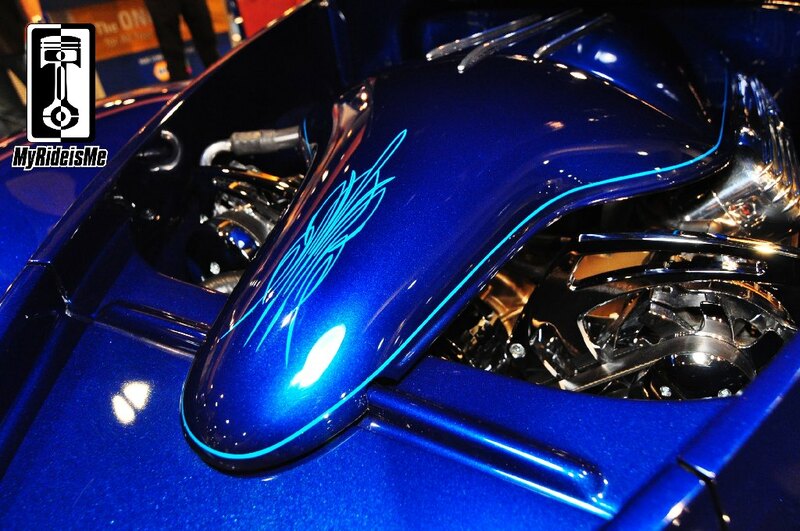 A custom engine cover hides a gold painted LS1 hooked to a 4L65E transmission. Keeping it in the family, Chris and Karma’s 14 year old son did the pinstriping. Looking closely, the lines are thin, even and slick. The boy’s got a future! Karma tells me he’s made enough money pinstriping to start work on his own truck. He’ll be styling when he’s old enough to drive! Not shown is all the detailed pinstriping on the frame. This is one of those cars that could be shown upside down too! Finally, here’s a look at the proud owners, Mike and Glenda Young standing with Karma and Chris Carlson. Great builders and quite the jokers too! Ask them their favorite ideas for terrorizing the cleaning crew at hotels on the way back to Kansas! No harm done, but I’d love to see and hear what they thought of Karma’s wild sense of humor! Thanks guys!